Fresh from causing a sensation with his avian design for the World Trade Center transportation hub, the architect and artist Santiago Calatrava is ready to make a second startling mark on the Lower Manhattan skyline with a residential tower unlike any New York has ever seen. It would take the form of an offset stack of 45-foot glass cubes, a dozen in all, each intended to house only one or two families. 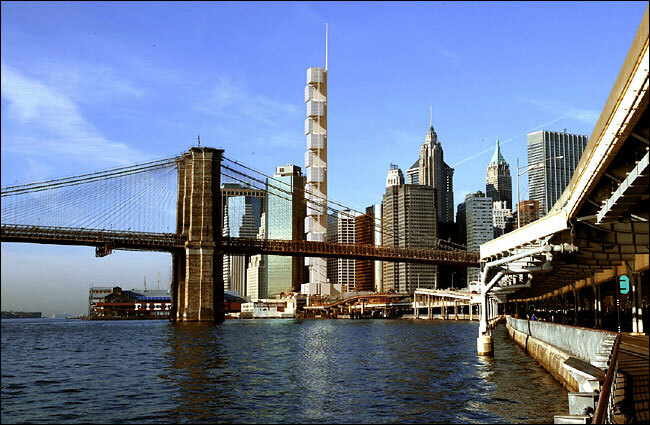 Resembling some of Mr. Calatrava's sculptures, but on a titanic scale of 835 feet, the tower would rise over the East River at South and Fletcher Streets, near the South Street Seaport and the Brooklyn Bridge. The developer, Frank J. Sciame, estimated its completion in 2006 or 2007. It will be very expensive to build - just how expensive the developer will not say - and very expensive for prospective owners. But then again, Mr. Sciame said, "you only need between 12 and 24 interested parties in the entire world." In an alternating pattern, four-story cubes would be cantilevered from a concrete core containing elevators, stairways, plumbing and electric lines. Alongside the cubes would be pairs of slender stabilizing spines, turning the entire composition into a gigantic truss. The top of one cube would serve as the terrace for the next cube up. The cubes could be single dwellings of about 10,000 square feet, or divided. The building would also have an eight-story base that could house a museum or other cultural institution. "We cannot say form follows function," Mr. Calatrava said yesterday by telephone from his home in Zurich. "In this case, function follows form. And it works." The tower would replace a six-story red-brick building at 80 South Street, upland from the sailing ship Wavertree, that serves as the headquarters of Sciame Development and the F. J. Sciame Construction Company. While there is no guarantee that the tower will be built, both Mr. Sciame and Mr. Calatrava have established reputations for completing unusual projects. Though it would be among the tallest apartment towers in New York, 80 South Street would have only 175,000 square feet of space. Mr. Sciame said he was trying to configure it so that it could be built "as of right"; that is, within existing zoning regulations and without the need for discretionary city approvals and a full public land-use review. So far, the project has been embraced by some of those who have seen it. "Santiago Calatrava's design concept for 80 South Street is one of the most unique and compelling this city has seen in decades," Amanda M. Burden, the director of the Department of City Planning, said in a statement yesterday. "It would add an extraordinary dimension to the East River skyline." Carl Weisbrod, the president of the Alliance for Downtown New York, which oversees the Lower Manhattan business improvement district, said 80 South Street would be a boon to the East River waterfront - "an area that has not gotten as much attention as the Hudson" - and to the South Street Seaport Historic District, in part by drawing down some of the unused development rights generated by the small structures in the district. Perhaps not every preservationist would agree that a structure reaching 1,000 feet at the tip of its mast would complement a nearby precinct of 19th-century countinghouses. But Madelyn Wils, the chairwoman of the Lower Manhattan community board, said she did not think that the structure's height would be controversial particularly given its slenderness and transparency. "It's such an unusual building, it's worth taking a chance on," she said. Mr. Calatrava, a Spanish citizen who is an artist as well as an architect and engineer, has explored the expression of the human body in sculptures of marble and ebony cubes supported by chromium-plated steel cables. His relationship with Mr. Sciame began two years ago, when he asked for help in remodeling his Upper East Side townhouse. Mr. Sciame, a contractor and a developer, said he was impressed by Mr. Calatrava's sculptures and by his Turning Torso apartment tower, under construction in Malmo, Sweden. He invited Mr. Calatrava to the South Street site, where the architect found a place to explore the torso theme on a colossal scale. "New York is the place to make a statement like that," Mr. Calatrava said. Though he has been a presence on the New York architectural scene since 1992, after he won a competition to complete the Cathedral Church of St. John the Divine, Mr. Calatrava's only finished work in the city is the Times Capsule of 2001, a sculptural time capsule commissioned by The New York Times, which stands outside the American Museum of Natural History. With his two new projects, Mr. Calatrava has jumped to the forefront of architects involved in rebuilding Lower Manhattan. And he seems to feel at home. "If I was not born in this lifetime in New York," he said yesterday, "certainly in a previous life, I was a New Yorker." I was just about to post this myself but instead I'll just say, DAMN he's good. Exceptional. This is exactly what NYC needs. Thank you, Santiago, thank you. Sciame, too! Santiago Calatrava has designed a skyscraper with the buoyancy of a child's balloon. The design takes me back to 1966 and the helium-filled Mylar "Silver Cloud" sculptures that Andy Warhol presented that year at Leo Castelli's gallery. The tower is effervescent, lighter than air. Yet its impact on the skyline is likely to be profound, not merely as an individual work of genius but as an example of what can be achieved when a city rediscovers the quality of delight. This is the first residential building Mr. Calatrava has designed in the United States, but 80 South Street Tower, at Fletcher and South Streets in Lower Manhattan, is based on a series of sculptures that he began in the 1980's. For these studies in rhythm, Mr. Calatrava used a modular vocabulary of identically sized marble cubes. Wires hold them in suspension in various vertical and diagonal configurations. The basic concept is flexible. Though the South Street Tower is strictly vertical, the same technique could be used to cantilever a structure out over the water, say, at a 45-degree angle. On South Street, 12 modular cubes, clad in glass, would be stacked into a tower of alternating solids and voids, cantilevered from either side of a central service core in a series of contrapuntal steps. Each cube measures 45 feet to a side and contains four floors of living space, at slightly more than 2,000 square feet per floor. The concrete core, a slender rectangle in plan, contains elevators, fire stairs and risers for plumbing and power. A metal armature attached to the outer sides of the cubes provides additional support. This arrangement leaves the interiors of the cubes unencumbered by columns and plumbing. The modules can be configured to contain one to four apartments each, and are served by separate elevators. Each cube, except the highest, provides an outdoor terrace for the one above. It would be a stairway-to-penthouse paradise, rising from a base of eight or nine stories. Frank J. Sciame Jr., the building's developer, said he hoped that he could attract a cultural institution to occupy the base, as if Mr. Calatrava's design were not enough of a cultural attraction on its own. Eighty South Street Tower would be the most original skyscraper to go up in the United States in many years. It would restore New York to a place where innovative architecture is generated, not merely acquired. And as the vision of a private developer, the tower rebukes all the hollow claims of boldness and excitement our builders habitually assert. I mention Warhol because of the atmosphere of freedom those ridiculous silver pillows created around them. They were a child's garden of existentialism - bits of nothingness, faintly stirring in the breeze of gallerygoer conversation. Still, there was a precision to them: Warhol would go in and adjust the little lead weights attached to the corners so that they would float in midair. And they were balanced, in the rear gallery, by the wallpaper with those silly pink cows. How did it happen that 1966 suddenly appeared to be encapsulated by the fleeting whimsy of silver clouds and pink cows? It seems that Mr. Calatrava has captured the imagination of New York. Hooray for us. As the warm reception that greeted his design for the World Trade Center transportation hub suggests, the city trusts him, to a degree it has seldom believed in any single architect in many years. This response may have as much to do with Mr. Calatrava's character as with the formal properties of his designs. In a field overpopulated with blowhards, his evident humility stands out. So does the apparent lack of irony. Though the work is eminently sophisticated in formal terms, the optimism it projects is disarmingly naïve. How dare an architect conjure these transcendent illusions for our disillusioned times! Does he believe this to be an age of faith, capable of building cathedrals? Recently Mr. Calatrava has been reading Spinoza. You don't have to do likewise to make sense of his work. But for those seeking insight into its qualities, I strongly recommend Antonio Damasio's excellent book "Looking for Spinoza: Joy, Sorrow and the Feeling Brain." Dr. Damasio, a neurologist, has achieved renown by challenging our lingering tendency to regard reason and emotion as polar opposites. Science suggests otherwise. Dr. Damasio, like Freud and Nietzsche, regards these faculties as necessary partners in a dialectic intent on freedom from debilitating habit. The book will not sit well with those who think that architecture is an art of people-pleasing. Spinoza's scheme of things was undeniably elitist. Only those with disciplined and educated intellects, Dr. Damasio writes, could accumulate sufficient knowledge and reason to put their intuitions to constructive use. But this path toward freedom is accessible to all who would make the sacrifices it entails. Eighty South Street Tower conveys the idea that an entire city can embark on such a path. That is the design's great gift. This idea is transmitted in the design's perfect balance between the familiar and the unexpected. We recognize the similarity of the individual glass cubes to International Style office towers of the mid-20th century. But we have never seen one of those towers dance. From certain angles, this building is all hips. Chicka-boom! We cherish the skyscrapers of prewar New York partly because of their articulated tops and stepped silhouettes. Eighty South Street can be seen as a building made almost entirely out of tops. Or, because the design uses an industrial aesthetic, we can see the cubes as echoes of Manhattan's water towers, those great building tops that are not made for aesthetic contemplation. Thus Mr. Calatrava recaptures that once-vigorous exchange between our cultivated and vernacular traditions. Every sports fan knows that it takes discipline as well as talent to play with the rules of the game. Architecture is no different. A city is never more fully human than when expertise - our own or someone else's - allows us access to ebullience, lightness and delight. Cool Building. The downtown boom continues, even if the NWTC turns out to be a failure, downtown will rebound. I love the fact that this building is as-of-right, that's very rare for such a tall building, and dramatically improves its chances of becoming a reality. Its really distinctive. Love it. It will add a real counterpoint to all the bland buildings around it. My jaw dropped when I read this on the train this morning. Such a unique design, and a counterbalance on the soon to be Hudson-heavy downtown skyline. Is there any way we can chain down this Calatrava guy and force him to keep designing buildings for NYC for the rest of his life? The link Christian posted above has a clickable image that opens to a much larger rendering. It's worth a look. This is a well-thought and carefully considered project. The developer owns the site and all air-rights. The slender, fairly transparent building will make a far better tall companion to the neighborhood than some clumsy monolith. The base is reserved for a cultural organization -- providing another downtown location for outstanding proposals not selected by the LMDC for the WTC cultural centers. There are many winners in this project; the bar has been raised for future developments that wish to be labeled as architectural jewels or to pose as benefitting the larger city. 1) This is the first time in 70 years that a building will go up downtown that actually complements the spires of such jewels as Woolworth, 70 Pine, 40 Wall, and 20 Exchange Pl., instead of dominating or obscuring them. 2) The building may come out even more impressive than the rendering, since in the rendering the cubes look white, but opaque. If they are reflective and/or transparent, this could look even better. 3) Unfortunately, tall apartment buildings are not usually lit up at night (e.g., Trump World Tower). I hope this will be an exception. The "Fact Sheet" on Christian's link say it will be 12 cubes at 45 feet high plus a 90 foot base. That only adds up to 630 feet. I have a feeling it is 835 feet to the tip if its spire, otherwise where is the missing 205 feet? Granted there might be a little additional say for a few feet between the cubes or some stuff on the roof but not 205 feet. That's because most residential buildings don't have ornamental crowns. This is more along the lines of Central Park Place, Citylights, Trump Palace or 425 Fifth, which all have nighttime lighting schemes due to their ornamental crowns. At the very least we can expect the spire to be illuminated.